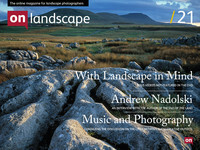 I bought a range of books last year to survey the photographic landscape. One genre of book was the ‘pseudo portfolio’; a vanity publication posing usually as a geographic guidebook. The photographic section of most bookshops normally has a range of these from various publishers and they typically consist of a short narrative section at the front followed by a cobbled together slew of photographs tied by a geographic location (How many 'guides' to Dorset do we need to be able to find Durdle Door? [66 by my search]). One book that I thought was going to be just that turned out a little different though. Although it follows the usual formula, in this case ‘The Ribble’ instead of ‘Cornwall’ or ‘West Highlands’, the subject has a little more depth in that it follows the course of the Ribble from the Three Peaks to the salt marshes near Preston and Lytham St Annes. I scanned through the book at first, noting that the photography hit some highs well above that I had seen in the rest of my clutch. It was only when I returned to the book later that I started to see a consistent look throughout the book. Although it does have a bunch of ‘filler’ images scattered throughout (who knows if the publisher had a hand in this), a large proportion of the images are very satisfying and accomplish that most important of tasks, showing you the subject through the photographers eyes. I have to admit that I have come back to this book on more than one occasion and spent an enjoyable half hour, scanning through and resting on some of the best pictures. I can recommend this book to anyone with an interest in the area and I would also say that about 1 in 4 pictures really float my boat. Have a look at the extracts below and take a look at Andy Latham’s website at http://www.andylatham.co.uk/ and if you want to buy a copy – please buy direct from Andy’s website using this link.